Having received new owners in 2011, Magor was thoroughly refurbished shortly afterwards. It's now offers more standard facilities, creating a new gateway for Wales. First two hours free for all vehicles, after which cars must pay £12 and HGVs, caravans and coaches £25, or £28 to include a £10 food voucher. Prices are paid using PayByPhone - more details or in the shop or restaurant. The location code is 7002. The services under First ownership. This is Wales's easternmost service station, and also its largest and busiest. When they owned it, First used the slogan "trying that little bit harder", which given their reputation prompted a response from critics of "...trying and failing". The filling station here is operated by Rontec, and was rebranded in 2017. It used to have Rontec's only "Stop 'n Eat" counter, which was a Rontec own brand serving hot food. It then changed fuel brand in summer 2018 from Esso. Because the filling station is under different ownership to the main amenity building, in 2009 First objected to a planning application from the filling station. When the services were granted planning permission in 1991, there were already advance plans to divert the M4 to the south. This didn't happen, but the idea came to light again in 2013. After the detail of the proposed new arrangement was published, which would leave Magor more than two miles from the M4, Roadchef published a detailed objection, breaking down their sales figures and claiming they would lose 80% of it. In doing so, they effectively threatened to close the services if this plan went ahead. Roadchef also revealed they were holding off a significant expansion to the services until its future was clear, and asked customers to support their campaign, Save Magor. From a business perspective, creating as big an objection as possible is likely to improve the compensation offered, if the plans continue in their current form. However as an employer Roadchef also has a duty to protect its staff, who would face redundancy if the services were to close. The original corridors around the building. Until Roadchef took over, the services were laid out with an unusual set-up where the restaurant servery was in the centre of the service area. However, the enclosed nature of the building and all the dividing walls meant the layout wasn't obvious, and it felt like a myriad of corridors with many dining options. This has now changed and a main corridor from the entrance leads you into a variety of stores and restaurants in the centre of the services. When Roadchef took over, they set up a new Restbite (originally it was going to be Hot Food Co.) restaurant, but didn't apply any of its branding as they intend to invest in a new Fresh Food Cafe if the sales figures allow for it. The restaurant area also gained The Burger Company, which in March 2012 became McDonald's. The unbranded shop became WHSmith. 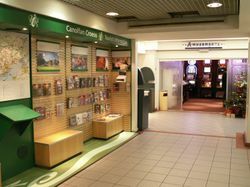 There were plans to turn the services into a gateway to Wales by expanding the tourist information services but this never officially happened. Magor was privately built in 1992. Its design is extremely unusual for something Granada built, suggesting somebody else may have done the design work. While there is no evidence of them opening it, Granada were definitely running it at least by 1993. The position of the services was chosen because Top Rank's nearby Severn View was about to lose most of its trade as the Second Severn Crossing would divert traffic away from it. When they tried to purchase Pavilion, Granada were set to gain four services in a row. As a result, they were instructed to sell Magor and Severn View, and a management buyout saw Magor change to First. In October 2008 First were acquired by Moto, meaning that this should have become a Moto service area, however the deal fell through. Instead First went very quiet, and in August 2011, Roadchef acquired the services. In April 2007, the members of Vans United voted Magor as the worst service station in Britain. The services were said to be well signed with sufficient parking spaces, but there was a lack of disabled access, high prices and poor hygiene. In 2006 Magor came near the bottom of Holiday Which? 's survey, having provided them with a "truly miserable experience". The food was condemned too. In 2001 the services came top in an AA survey, who rated it "acceptable". In 2000 critic Egon Ronay praised the catering at these services, having criticised just about every other service area.